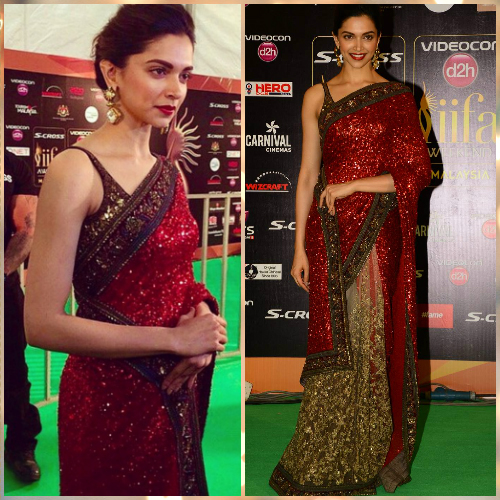 6 Times That Deepika Padukone Wore Red And Made Us Go WOW! Deepika Padukone has mastered the art of stealing our hearts over and over again. Whether it's with her on-screen performances, her charismatic personality, her gentle and grounded disposition or her beauty and style! There is never a time she leaves us disappointed. And when she wears the colour red, we cannot help but fall in love with her even more! Here are some of those instances when she bowled us over dressed in hues of crimson. 1. The Orderly Cape Suit! Image Source: Deepika Padukone On Instagram Deepika looks more than stunning in this red cape suit, don’t you agree? Very few can pull off red from top to bottom and especially in a suit. Deepika surely knows how to nail this look! With the sleek hairstyle and minimal accessories including the red pumps, we are completely smitten! 2. The Sheer Floral Beauty! Image Source: Deepika Padukone On Instagram Be it Indian or western silhouettes, our style queen knows how to carry every look with elan. Here, she’s wearing a sensual lace embroidered saree with a high neck contrasting floral blouse! Those pretty gold danglers give the right kind of finish! This is pure gold! Image Source: Shaleena Nathani On Instagram Oh this beauty! In this neverending-train red shimmery gown, she definitely broke some hearts. The deep cowled back, the fitted dress and the simple yet charming drop earrings are all well suited for a glamorous princess as she! This sets the bar high, so high! 4. The Very Exclusive Heiress! Image Source: Deepika Padukone On Instagram Talk about simplicity and immaculate gorgeousness. That’s her. She looks fresh and so alive in this buttoned dress! The girly tie-up at the waist and those gathers give her such a stylish look! And that lovely surprise at her feet breaks the red so beautifully! Image Source: Sabyasachi On Instagram Shiny gold and seductive red…Deepika looks dreamy in this creation! The red takes over like a carpet of rubies and makes her glow ever more! We love those dangling earrings and the thin strapped blouse under the saree. The bare hands and neck balance this look out seamlessly! 6. The Sharp Savvy Look!